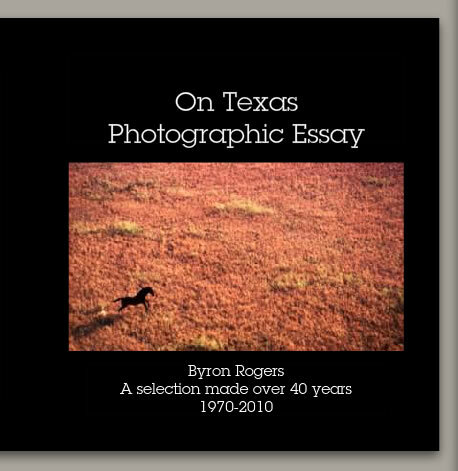 Join me at the Cactus Hotel mezzanine level downtown San Angelo on Thursday November 20, 2014 starting at 5:00 pm to 9:00 pm for the showing and signing of my new book On Texas Photographic Essay – A Selection made over 40 years – 1970-2010. The new books are signed hardback books sized at 8 x 8 inches in a limited edition of 20. Each book is signed by Byron in acid-free ink and numbered 1 of 20 — 2 of 20 — 3 of 20 — 4 of 20 — 5 of 20 — ect. Byron has been showing his artist working proof to people and they have asked if the book is available for sale. The purpose of this first limited edition of 20 is to let all who want a selection of Byron’s work in a special book form and at a reasonable selling point. Byron will never make the same book in the same size with only this selection of images ever again. This event is in conjunction with the monthly Art Walk in San Angelo. After that date it will be available on ByronRogers.com for San Angelo and world. Gallery On Texas 3 is now full. This makes 48 total images in the three Gallery pages. With the completion of Gallery 3 the website is finished with a select group from the total that make up the On Texas Photographic Essay. There maybe changes and or additions still to come. I need time to live with the choices shown on the website. Don’t forget I still need to look through my negatives and make selections for On Texas Photographic Essay. For now there is one negative (Haircut) on the site. Remember if you want to see the complete image click the smaller one and then you will get the full size and more information about each image. Love to hear what you think about any of the images. The project On Texas is in the unfinished stage. I still need to look over all of my negatives. Back when I had access to 12 feet of professional light tables I only looked through all of my transparencies and none of the negatives. Part of the reason I did not look over the negatives was the time required and I really needed a rest after taking three months to see all the transparencies. At this time I do not have access to 12 feet of professional light tables so I will need to wait for that to happen again. There are a lot less negatives to look over than the transparencies but in the negatives are several images I know will add greatly to the On Texas project. One image that comes to mind is the black and white Haircut photograph made in 1974 in Huntsville. I am looking forward to looking over all the negatives to see what else can be added to the On Texas Photographic Essay. Be sure to watch this website as the project continues. You can also subscribe using RSS or your email by filling the form below on the bottom left.